When I was young I remember playing the board game Bizzy, Bizzy Bumblebees. Bizzy, Bizzy Bumblebees is one of those silly dexterity games that were made for young children that tend to make adults look like fools when they play them. 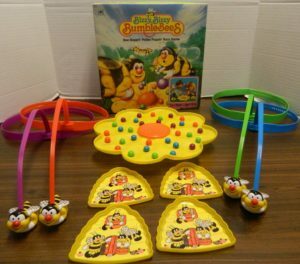 While I can remember enjoying the game when I was young, I haven’t played Bizzy, Bizzy Bumblebees in over 20-25 years. Like most of the games I enjoyed when I was young, I didn’t have high expectations for Bizzy, Bizzy Bumblebees. While Bizzy, Bizzy Bumblebees could be a blast for young children, it mostly just makes adults look like a fool. Each player chooses a color and takes the headband and support rod of that color. The players assemble their headband by adjusting it to fit their head. Then they attach the support to the headband and add a bee onto the end of the support. Each player also takes one of the beehives and places it in front of themselves. Place the flower in the middle of the table and place one marble in each indentation in the flower. When everyone is ready the game begins. All of the players use the bee on the end of their headband to pick up marbles. Once a player has picked up a marble they can use their hands to remove it from their bee and place it in their beehive. The player is trying to use their bumblebee to pick up one of the marbles from the gameboard. Any marbles that fall on the table are removed from the game. Players cannot purposely hit another player’s bumblebee with their own. You cannot purposely slam the flower with your bumblebee. The game ends when all of the marbles have been removed from the flower. All of the players count up how many marbles they have collected. The player who collected the most marbles wins the game. The players have collected marbles as follows (from left to right): 10, 8, 7, and 7. Since the player on the left collected the most marbles they have won the game. Keep the flower in the gamebox which should limit the flower from rocking back and forth. Players could choose to only collect the marbles that match their own headband color. If a player picks up a marble that belongs to another player, that marble is put back on the flower. The first player to collect all eight of their marbles wins the game. Players can also choose to assign a point value to each color marble. The point values are as follows: blue-4 points, green-3 points, purple-2 points and red-1 point. At the end of the game the players count up their points. The player with the most points wins the game. With Bizzy, Bizzy Bumblebees basically being a game made for young children I didn’t have high expectations for it appealing to adults. After playing Bizzy, Bizzy Bumblebees I have to say that it is basically what I expected it to be. Bizzy, Bizzy Bumblebees is a silly game that was not made for adults. 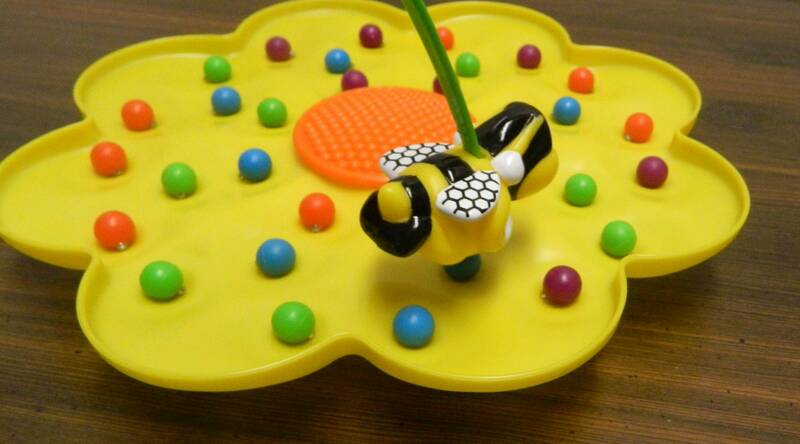 The game was meant for younger children as it is a simple dexterity game where you use the bee attached to your headband to pick up marbles. I will give the game credit for being a unique experience though. 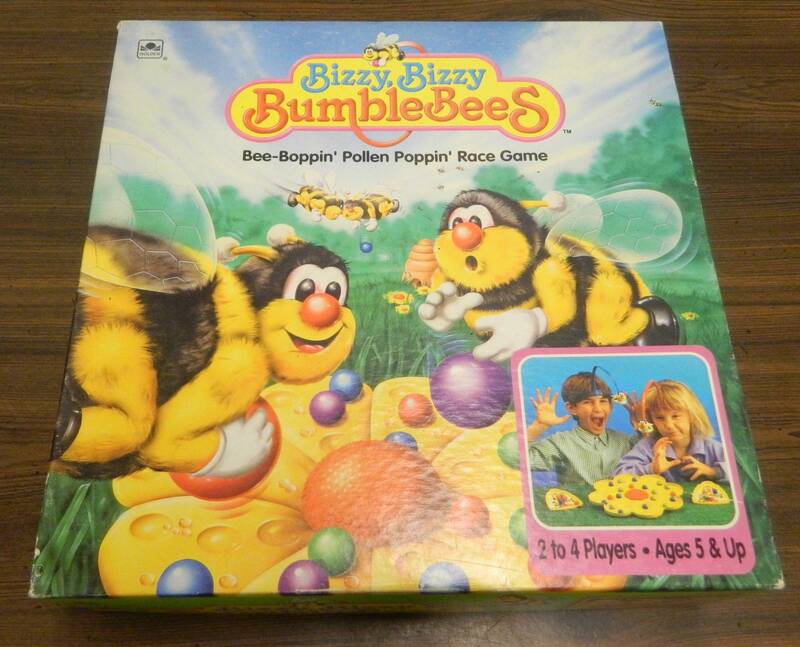 I have played a lot of board games and yet have not played a game quite like Bizzy, Bizzy Bumblebees. If you like to try out silly games Bizzy, Bizzy Bumblebees is one of those games that you might want to try once just to see how silly it truly is. Bizzy, Bizzy Bumblebees is a downright silly game though. If you don’t like to look like a fool, it is not the game for you. I would find it to be really hard to not laugh at a group of adults playing the board game as adults look quite ridiculous playing the game. The designers even had this in mind because the game actually has a rule where you can’t laugh at adults who are playing the game. For a carefree group that doesn’t take things too seriously or a group that has already had some drinks, I could see adults getting some laughs out of the game. The biggest problem with Bizzy, Bizzy Bumblebees is that there just isn’t that much to the game. You put on your headband and try to pick up the marbles. There is a little skill to the game as you can use your bee to manipulate the marbles to make them easier to pick up. Some players are going to be better at the game than other players. The game still relies pretty heavily on luck though as luck is the determining factor in who wins the game most of the time. As an adult Bizzy, Bizzy Bumblebees is a unique experience but it just doesn’t last. 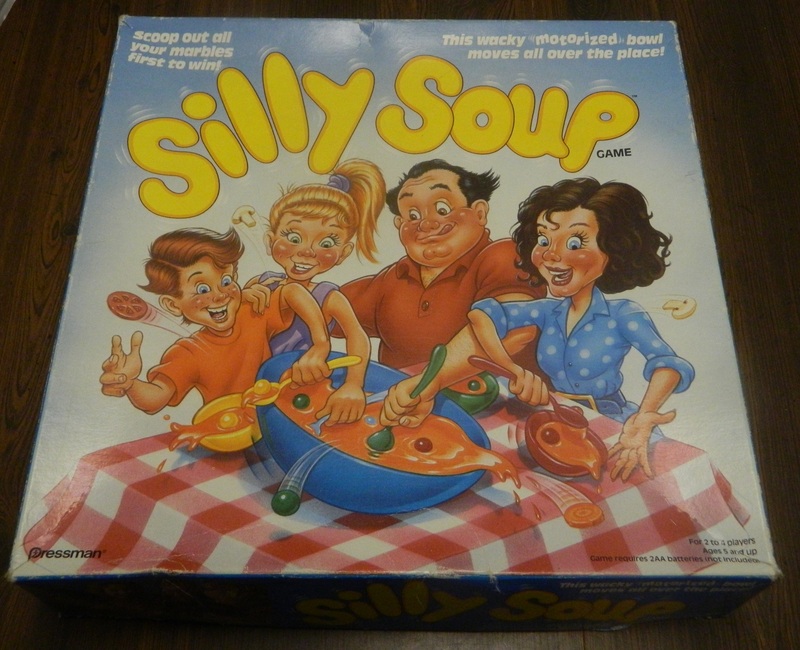 For the first couple of games you can actually have some fun with the game if you don’t mind playing goofy games. The fun doesn’t really last though. After a couple games Bizzy, Bizzy Bumblebees becomes pretty repetitive. Basically you just end up doing the same thing over and over again. With only a little skill in the game it feels like you are going through the motions after the first couple of games. While Bizzy, Bizzy Bumblebees is a game that is worth trying if you like these type of children’s games, the experience doesn’t last that long. As Bizzy, Bizzy Bumblebees was a game made for young children I don’t think it is fair to just look at it from an adult’s perspective. While I didn’t play the game with any children when I played it recently, I will say that I remember enjoying the game when I was young. I see Bizzy, Bizzy Bumblebees working really well with young children for a couple reasons. First the game is so simple that young children should have no trouble with it. 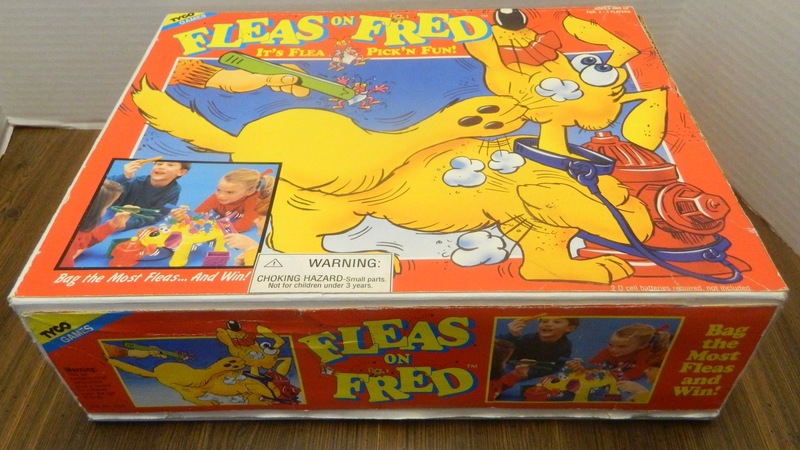 If it wasn’t for the potential choking hazard with the marbles, I could see children under five playing the game. Basically you just put on the headband and try to pick up marbles. While an adult should probably explain the game to children who have never played the game, I can’t see young children having any trouble playing the game. Next Bizzy, Bizzy Bumblebees is really short. I would say the average game should take five minutes at max to finish. It is not that hard to pick up the marbles and since there are only 32 marbles they all get picked up pretty quickly. While I think the game would have benefited from being longer (at least for adults), I think the short length should appeal to younger children. I think the main reason that young children will enjoy the game is because it is just silly fun. I think the concept of picking up marbles with a bee attached to their head will really appeal to a lot of young children. The mechanic is kind of fun but gets repetitive a little too quickly for adults. I don’t see the same problem for younger children. Children from around five to ten or so will probably love the game. Older children will probably find the game to be kind of dull though. While the game doesn’t work that well for adults, I do see the game being quite a bit better for adults playing with their young children as they can share in the enjoyment that their kid(s) are having with the game. While the game is self explanatory I could see Bizzy, Bizzy Bumblebees being a game that may need some adult supervision. I don’t see it usually being a problem but there is a small possibility that the game could become too aggressive. If players are too aggressive they could end up hitting the other players with their bee which could lead to some small injuries. The game does recommend players take off their glasses before playing the game to prevent them from being scratched. I don’t know if this is necessary though unless the players get too rowdy. Finally I want to quickly talk about the component quality. For the most part I would say the components are actually pretty good. All of the components are made out of plastic but they are sturdy enough. The components are pretty cute for the most part. The bees do a good enough job picking up the marbles. Some of the bees’ magnets seem a little stronger than others though. This could easily be because of the game’s age though as the game is over 25 years old at this point. I would also like to point out that while adults can play the game, if you have a larger head the headband is going to be a snug fit. Should You Buy Bizzy, Bizzy Bumblebees? Bizzy, Bizzy Bumblebees is basically what I have come to expect from of a lot of silly children’s games. The game is a unique experience that I really haven’t seen from other board games. The game has a little skill but it still relies pretty heavily on luck. For adults who like these wacky children’s game, I would say Bizzy, Bizzy Bumblebees is worth trying as you can have some fun with the game and have some laughs. With the lack of depth in the game though it can get repetitive pretty quickly. For young children and their parents though I think they can get a lot of fun out of Bizzy, Bizzy Bumblebees as the game is simple, short and silly. With this in mind I would say my final rating is kind of a reflection of both groups of players. If you don’t have young children I would say the game would probably get around a 1.5 to a 2. For younger children though I could easily see the game being more worthy of a 3.5 to a 4. If you don’t like wacky children games you will not like Bizzy, Bizzy Bumblebees as the game will definitely make you look like a fool. If you like these type of children’s games but don’t have young children, the game is worth trying but probably won’t be worth playing for long so I would only pick it up if you can get a really good deal. If you have younger children who would like this type of game though, I think you will really enjoy Bizzy, Bizzy Bumblebees. Could be a blast for younger children. A novel and original idea for a board game. Nothing more than a novelty for older children and adults.